When Sarah Genereux heard Ariane Kirtley and the students from Oneness-Family School present the Amman Imman project at the Montessori Peace Academy conference in Clearwater Beach, Florida, she committed herself to help. "Personally, you have inspired me. If there is anything I can do, I will. Thank you, thank you, thank you," she wrote. Sarah has been true to her word. Since the conference in November, 2006, Sarah and her students at Montessori by the Sea in the Cayman Islands have sponsored a read-a-thon, operated a booth at a craft fair and raised awareness about the desperate situation in the Azawak in their local community. Read about their activities in an earlier post by clicking here. Seven-year-old Mariane McMurdo raised $200 for Amman Imman at her birthday party. Read her story in The Value of Presents. In March, eight-year-old Dylan Bostock organized a car wash which raised $1,000. That same young student spoke about Amman Imman at the local Rotary Club which subsequently matched the car wash funds. His efforts were documented in a local newspaper article with the title, "A Future Humanitarian Leader". Seems to me Dylan is manifesting leadership right now in the present! Fourth year student Annabel Brooks combined her interest in Asian Art and Amman Imman to have an art show with items for sale and a raffle with all proceeds going to Amman Imman. Thank you for your creativity, Annabel! By keeping her promise, Sarah paved the way for students at Montessori By The Sea to take their own initiative. She felt moved to help, communicated the stories about the Azawak that she heard from Ariane to her students, who took the initiative to tell the stories to others and raise money for Amman Imman. This web of support, starting with Ariane, then followed through by Sarah, and now carried on by the students at Montessori By The Sea, is indicative of how one person's efforts to right a wrong can tip the scales toward change. 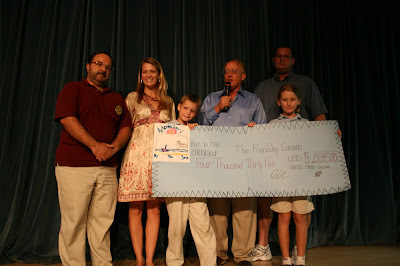 To celebrate their success and bring Amman Imman closer to the children at her school, Sarah Genereux invited Michael Kirtley, president of the Friendship Caravan, the non-profit organization under which Program Amman Imman operates, to come to the Cayman Islands and pick up a check. The island's newspaper, the Cayman Compass covered Michael Kirtley's visit to the school and published an editorial about the students' efforts over the school year, challenging all Caymanians to take action. The new but fast–growing field of astrobiology has increasing numbers of scientists imagining how life beyond the Earth – if there is any – might be structured and how it might function. Water, most of them agree, is a prerequisite to any extraterrestrial life. But this assumption may be the result of an Earth–bias, because here on Earth, water is virtually everything. Some 70 per cent of our world is covered by water. All life we know of at this time requires water, at least at the cellular level. Our own bodies are about two–thirds water. Given this vital role, one might think that our species would have figured out long ago how to make sure that everyone of us had enough water to make it through every day. Sadly, however, that is no where near the harsh reality many tens of millions face today. Here in the flashy high–tech 21st Century, more than 1 billion members of the human family do not have consistent access to safe drinking water. As a result of this staggering depravation, some 5 million people – mostly children – die from water–borne diseases each year in the developing world. Raging fevers, cruel cramps and the fading light in a child’s eyes are routine realities for many. Anyone with even a minimal amount of compassion can not easily stomach the suffering that comes with a daily death toll of 6,000 children. For reasons difficult to understand, most of the world’s people and most of Cayman’s people are either unaware or able to ignore the suffering of our neighbours. Not all, however, are willing to look the other way. Students and teachers at Grand Cayman’s Montessori by the Sea raised more than $4,000 for Amman Imman (Water is Life), an organisation that digs wells in Niger, Africa. Undoubtedly, their efforts will save lives. The young students did it by sponsoring a read–a–thon, giving ribbons for donations and selling hand–made crafts. They presented their donation to visiting Amman Imman president Michael Kirtely last week. It is easy to praise children for their social awareness, of course. 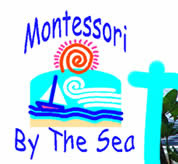 But the good works of these Montessori by the Sea students are more than an example of compassion and positive action for the rest of us to admire. Their efforts are a direct challenge to all Caymanians. Each one of us can and should do more for those who suffer in extreme poverty—particularly the children. If we are a country of moral people, then our love and concern for others must extend beyond our shores. Compassion is a virtue that should not be limited by things so relatively trivial as geography and national borders.